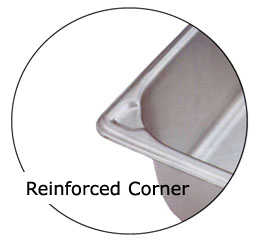 The Reinforcer® corner, a Vollrath exclusive, withstands more impact than ordinary pans. Since corners won't bend, the pan sits flat in steam table wells - saving energy and improving the look and cleanliness of your buffet line. 20 7/8" x 12 13/16"
10 3/8" x 12 13/16"
20 7/8" x 6 3/8"
6 15/16" x 12 13/16"
6 3/8" x 10 7/8"
6 15/16" x 6 3/8"
6 15/16" x 4 1/4"